With many first-in-segment features and the fluidic 2.0 design philosophy, this car is a built to make everyday an adventure. A mundane lifestyle is for those who like to play safe. But those who dare to escape the everyday are the ones who live active. 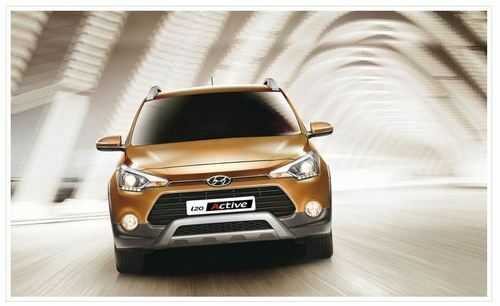 The i20 Active is powered by two performance-packed, proven and reliable engines – 1.2L Kappa Dual VTVT petrol engine and 1.4L U2 CRDi diesel engines. You can set, control important functions on your finger tip to avoid distraction and maximize convenience and safety. This funky yet functional beauty is something that you have been always waiting for. The aggressive front grille with multi-feature lamps, the glossy black finish pillar and tailgate spoilers make this car an active drive. Saboo Motors, brainchild of Ramdayal Saboo, has evolved into a legendary, leading and the most reliable automobile dealer in AP for the last 42 years. We have been known for our impeccable quality Service and customer satisfaction, which we assure you will personally experience in this relationship as well. SABOO is proud to be associated with the internationally acclaimed Hyundai Motors, which has brought to India, the finest and most sturdy ‘Value Packed’ cars. We are confident that your choice of vehicle will deliver the best of riding experience, fuel efficiency and steadfast performance as assured. We have a 16000 sft sprawling showroom and state of the art 50,000 sft. ultra-modern fully automated workshop for efficient, swift and satisfactory service as and when the maintenance of your vehicle is scheduled. Our vision: WOW the customer with impeccable quality Service and customer satisfaction.